Hibiscus or Sudanese rose It belongs to the family Malvaceae, There are in the world to 150 its species. The plant is widespread in Sudan, Ceylon, Egypt, China, Mexico. It is very decorative, against the background of dark green leaves his large bright red flowers look beautiful. In the southern countries are often used in cooking: Young leaves are cut into salads, they are used when extinguishing with meat, roasted seeds are added to the first courses. Drink Hibiscus everywhere prepared only in Egypt and Sudan, applying a floral calyx, epicalyx and leaves. 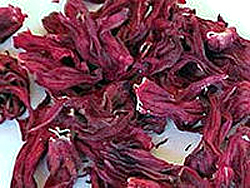 The Egyptians of old believed Hibiscus also excellent remedy for all ailments. Really, Modern research has confirmed that it contains many vitamins, in particular, vitamin C, organic acids, especially citric, micronutrient complex, amino acids. 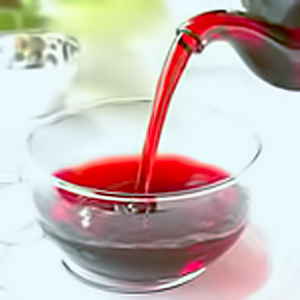 Sourish Hibiscus drink very refreshing in the heat, wherein the cold infusion lowers the pressure in hypertension, and hot hypotension increases. It has a strong property of strengthening vessels, accelerates metabolism, tones, It kills some bacteria, It has a mild diuretic effect, It cleans the liver, improves bile production, eliminates eye fatigue, as well as a vitamin supplement helps in boosting immunity during flu epidemics. What a way to correct welding Hibiscus? There are different opinions about the proper brewing Hibiscus. Some recommend brew dried shredded petals as tea. This method is good for a quick drink at a brewing regular tea Hibiscus from the pack. take from 1 ch.l. in a glass, pour boiling water, covered and insist 10 minutes, filter and add sugar to taste. Optimal in demanding gourmets considered a method of cold infusion of flowers and their subsequent boiling. For this dry inflorescences need to put into cold water for several hours and infuse, then slowly bring the contents to boil at low heat, through 3-5 minutes set aside the dishes, cover and press until a ruby ​​infusion. Sweeten to taste, summer in a chilled drink, you can add ice cubes. Inflorescences can also be eaten, they have a lot of protein and vitamins. note, the water for the tea hibiscus should be just soft and purified, Do not use for brewing metal and aluminum dishes, otherwise suffer color and taste. How to drink tea with ginger? Can I drink the infusion of tea fungus, and his drink? How to care for the Kombucha? How to grow the Kombucha from scratch? Can I drink tea with milk? Tea with honey and lemon - drinking?